Pear Shaped Peridot and Diamond Pendant Necklace 14k White Gold by Allurez. 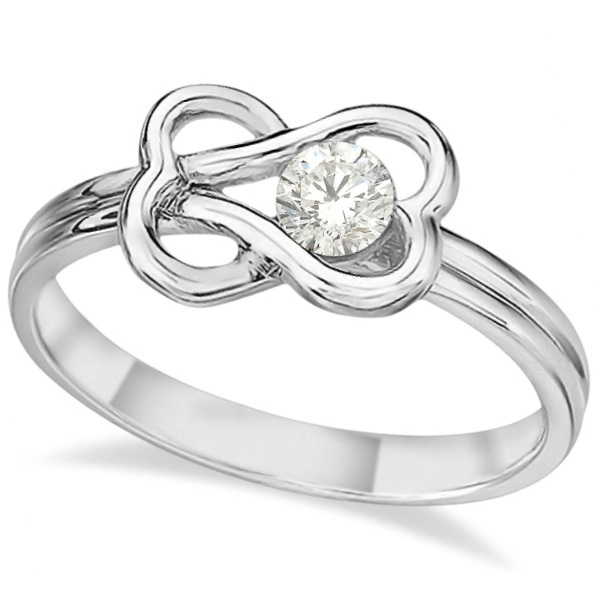 August babies have a few options when it comes to their birthstone! In 2016, August joined June and December as the one of the three calendar months represented by three gemstones. Read more to see what they are! The original birthstone for August was sardonyx, which has alternating layers of sard and onyx (two types of the layered mineral chalcedony) and is a reddish stone with white stripes. It measures 6.5 on the Mohs hardness scale. Next, peridot was added and it became August’s primary gemstone. Peridot has a lime green color and is a variety of the mineral olivine, which forms deep inside the earth’s mantle and comes to the earth’s surface by volcanoes. Peridot can also rarely be found inside meteorites and in 2005 it was found in comet dust brought back from the Stardust robotic space probe. It also comes in a olive green color, and the different shades of green have to do with the different levels of iron present in the stone. It’s not a very hard gem and measures 6.5-7 on the Mohs hardness scale. For that reason, its not recommended to buy peridot rings if they will be worn on a daily basis. 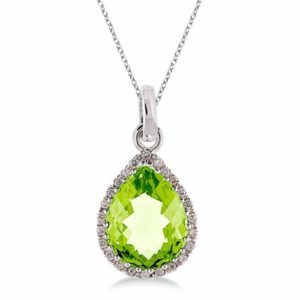 It’s more practical to opt for peridot pendants. Peridot can also be damaged by acid and long-term exposure to perspiration, according to the Gemological Institute of America (GIA). Because of its color, throughout history peridot has been confused with other gemstones such as topaz and emerald, according to GIA. For example the Shrine of the Three Holy Kings in Germany’s Cologne Cathedral is decorated with 200 carats of gems and they were believed to be emeralds, but actually they are, in fact, peridots. Spinel, which can be found in a variety of colors, was the last gem added to the month of August. 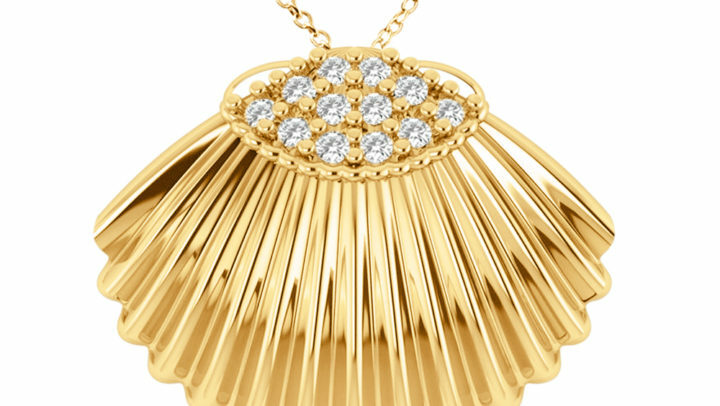 It was added in 2016 by the Jewelers of America and the American Gem Trade Association (AGTA). Highly sought after (and expensive) spinels have a vibrant red color. The next desirable colors are cobalt blue, bright pink and bright orange. More affordable spinels are often pale in color, such as lavender, but its also possible to find spinel in black, violet blue, greenish blue, grayish, pale pink, mauve, yellow or brown. 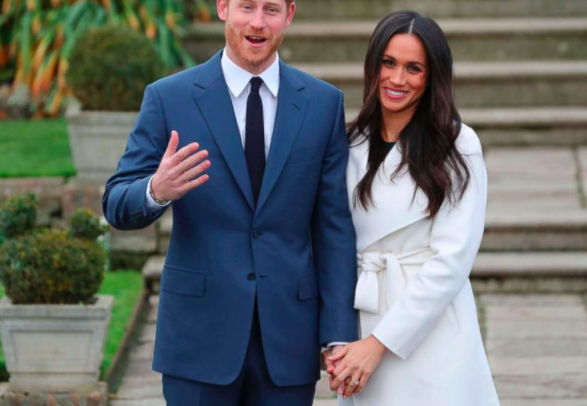 Spinel is often mistaken for either a ruby or sapphire (and vise versa), and such is the case with the Black Prince Ruby that is on the British Imperial State Crown, which has been confirmed to be a large red spinel. But the crystal structure of spinel and its single refraction makes it different from other gems, according to the American Gem Society. Spinel also measures lower on the Mohs hardness scale than a ruby and sapphire. 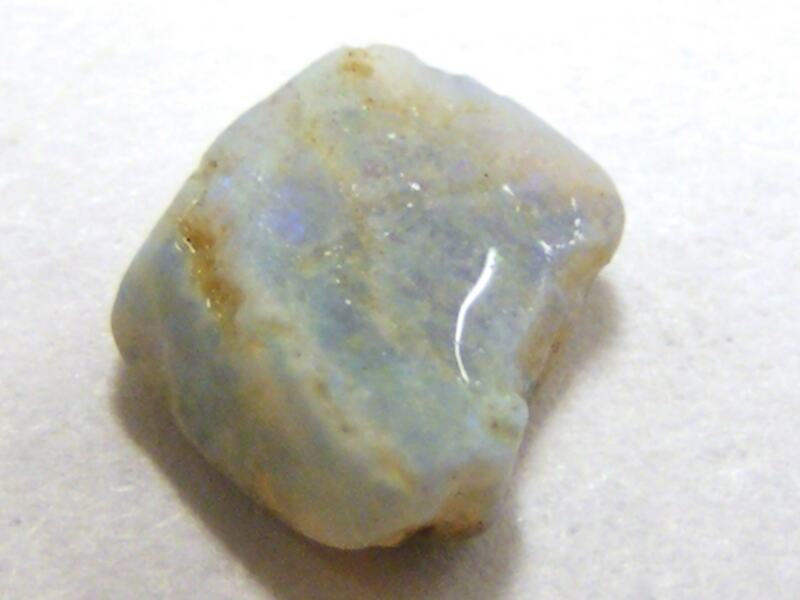 The gem is also “highly brilliant when polished” and is a relatively affordable gemstone, according to Forbes magazine. A few years ago a rare 50.13-carat rose-hued spinel, called the Hope Spinel, sold at auction for $1.4 million. 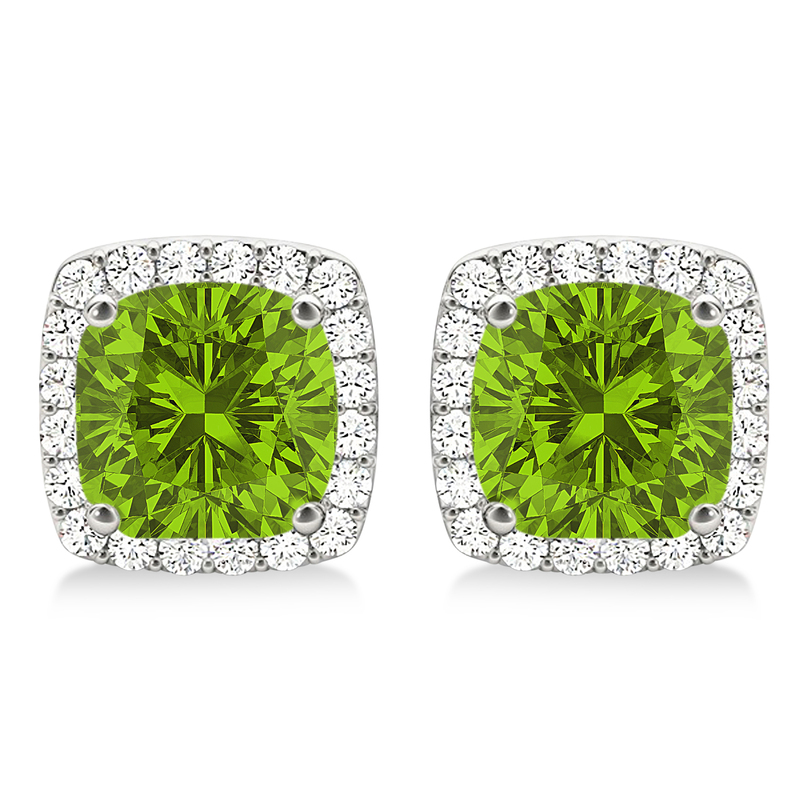 Cushion Cut Peridot & Diamond Halo Earrings 14k White Gold (1.50ct) by Allurez. 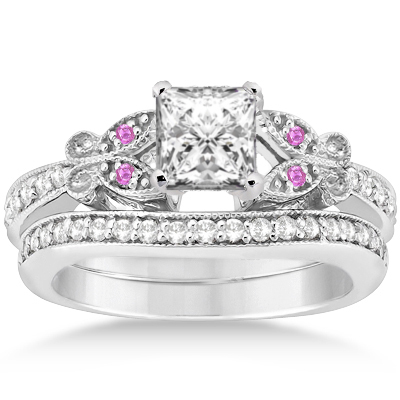 The spinel was believed in ancient times to protect people from harm and to take away its owner’s sadness. Sardonyx, has been used as a stone of strength and protection since ancient times, and it is associated with courage, happiness, and clear communication, according to the American Gem Society. Ancient Greek and Roman soldiers went into battle wearing sardonyx talismans that had engravings with images of heroes and gods, like Hercules. They believed the stone could draw from the bravery of those figures and give its owner courage, victory and protection on the battlefield. By contrast, in the Renaissance period, sardonyx was believed to help a person be more eloquent. Public speakers and orators wore the gemstone to help them think clearly and communicate well. Some also believe that putting sardonyx at each corner of a house will bring protection against evil, the American Gem Society noted. Like sardonyx, peridot has also been used for centuries as a protective talisman to shield its owner from evil and nightmares. The Egyptians called it the “gem of the sun” and according to GIA, peridot is believed to bring purity and health to its owner. It is also associated with prosperity and good fortune, according to the American Gem Society, and maybe its because some believe the gem’s name is rooted in the Greek word peridona, which means “giving plenty.” Peridot is also the 15th anniversary gemstone. 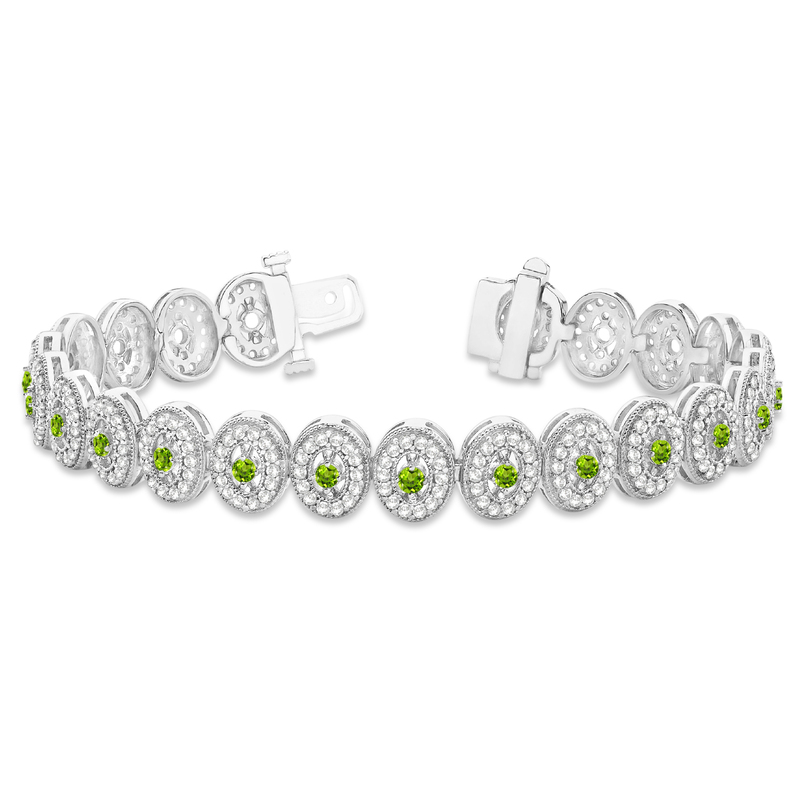 Peridot Halo Vintage Bracelet 18k White Gold (6.00ct) by Allurez. 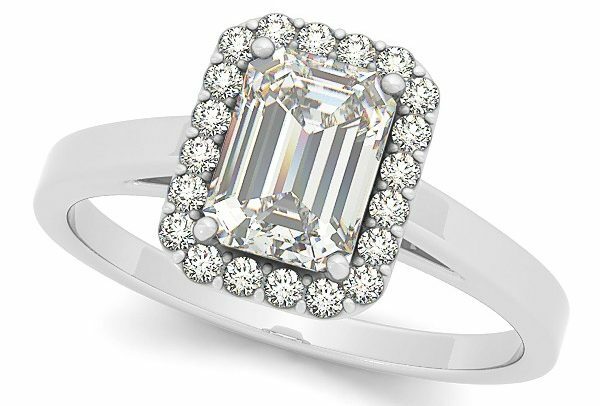 The 4C’s (cut, clarity, carat and color ) are the standards to measure any gemstone when considering to buy one, but there are also other factors to consider when shopping for jewelry associated with the stones of August. According to the American Gem Society, quality peridots have a lime green color to them, without any hints of brown or yellow, and no inclusions that are visible to the naked eye (though dark spots may be seen with the help of a microscope). 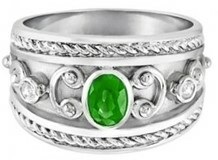 Because of rich deposits of peridot that were discovered in Pakistan in the 1990s, the gem is relatively inexpensive. And as with most gems, prices increase as the stone gets bigger. When it comes to peridot jewelry, as we said before, because its not a very hard gem, its not recommended for use in rings that will be worn on a daily basis (so think wisely if you’re leaning toward a peridot engagement ring). Unlike the peridot, the spinel is a hard and durable gem, which makes it ideal for almost any type of jewelry. It can also be found in various cuts like octagons, trillions, squares, rounds and fancy shapes, like ovals, pears, and cushions. Watch the video below to learn about a raw peridot crystal.